The Mars-Ice project is a joint project between the USGS Astrogeology Research Program (Flagstaff, AZ) and the Arizona State University Mars Space Flight Facility (Tempe, AZ) to bring together a single resource for the exploration of martian ices. Much of this research is done at the USGS Flagstaff Science Center. Like Earth, the polar regions are excellent areas to find ice. Click here to read more about research in the North Pole region on Mars. There is a great deal of information on the South Pole thanks to the Mars Polar Lander. Click here to read about the data collected and subsequent research. The Tharsis region is located approximately between -30° to 60° latitude and 210° and 270° longitude. 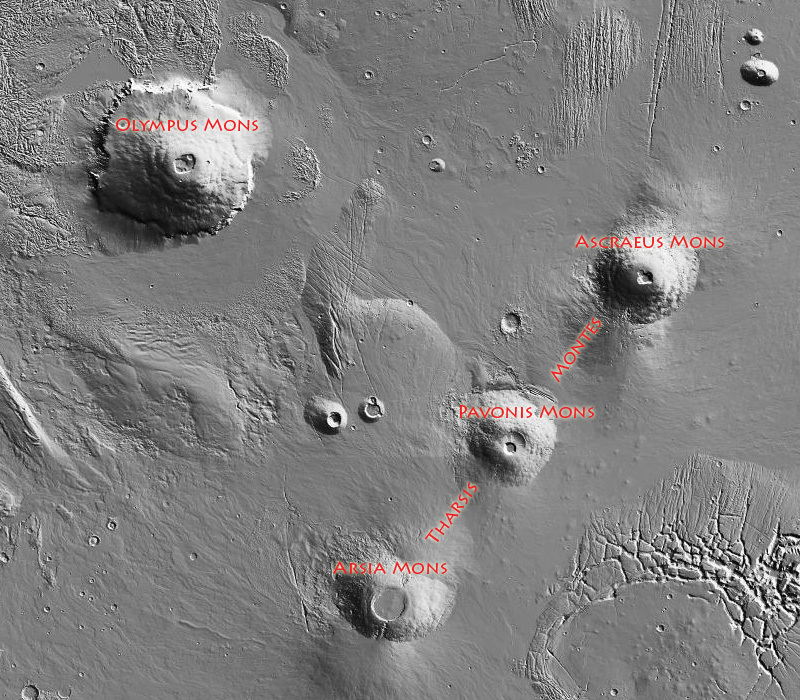 This area encompasses four major volcanoes: Olympus, Ascraeus, Pavonis, and Arsia Mons. Frost formation on the highest portions of these peaks make this area important in the study of Mars ice.